ICE-Pro is a purpose-built, modified version of C-OPS, which includes both a matching surface reference sensor (on a tripod, Figure 1) and a PAR cosine reference sensor (Figure 2) that is deployed just below the ice away from the bore-hole. It is designed to be deployed through a standard 10" ice-auger hole (Figure 3). Figure 1. 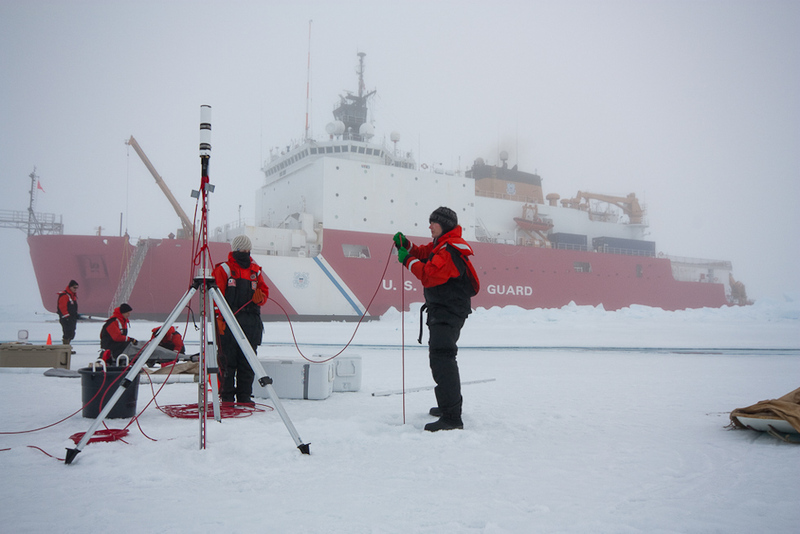 Dr. Karen Frey (Clark University) deployed ICE-Pro during the Impacts of Climate change on the Eco-Systems and Chemistry of the Arctic Pacific Environment (ICESCAPE) 2010 campaign. Dr. Frey described ICE-Pro and its deployment during ICESCAPE in the NASA-sponsored blog she contributed to during the campaign. Figure 2. A close-up view of ICE-Pro. 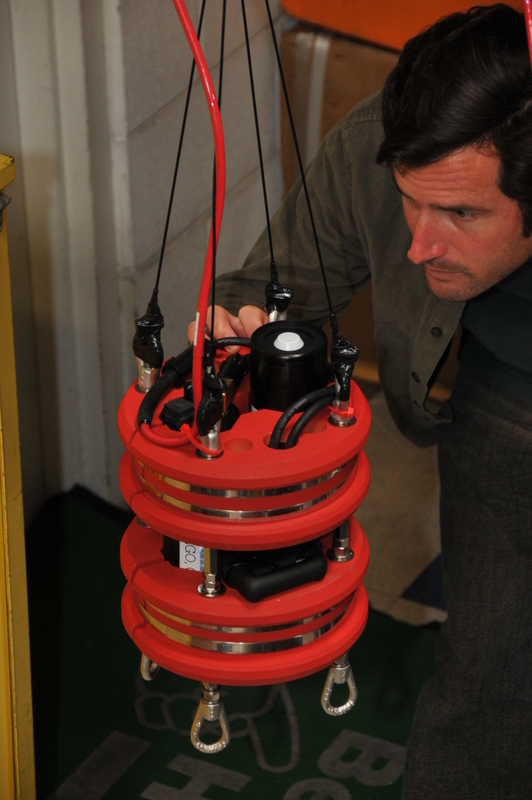 ICE-Pro is, in actuality, a C-OPS spectral irradiance profiler packaged in a custom configuration for work in the Arctic. This configuration is designed for insertion through a hole in the Arctic ice. Randy Lind (BSI) is inspecting his design. Figure 3. 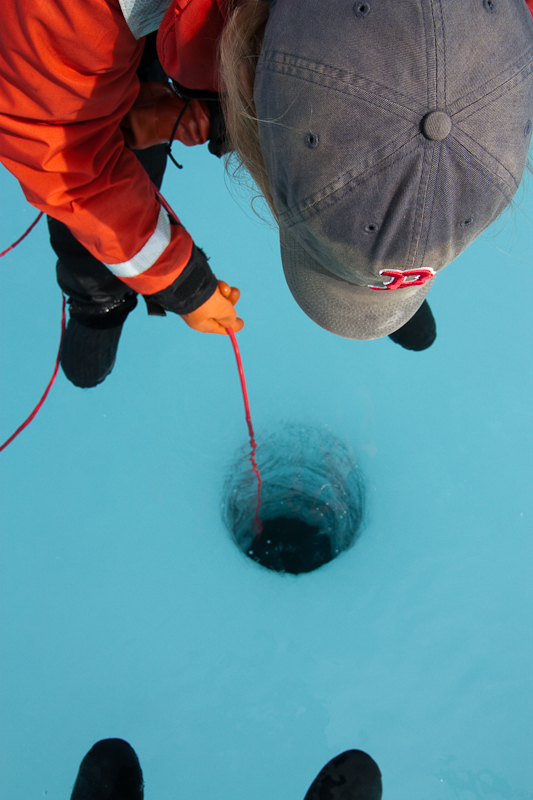 Dr. Karen Frey and her students deploy ICE-Pro through a hole bored through the ice on the NASA-sponsored research cruise. In the blog, Dr. Frey has a link for a video (hosted on the website "flickr") showing the actual ICE-Pro deployment, but from an unusual vantage point—the video was taken from below the ice! An article detailing Dr. Frey's research and her use of ICE-Pro (mentioned in the article as a "modified C-OPS" was published in the journal Geophysical Research Letters, and is available here.